TABLES TVSS Series Countertop Edge TSS, TMS, TSAG Series  Take Our Tables To New Heights! ADJUSTABLE TABLE HEIGHT UPGRADE (Up to 6' tables only. Ships set up.) • Add To Any Tubular Leg Style Table with Undershelf • Adjust Table Height From 31 1/2”- 40 1/2” • Easy Turning, Non-Obstructive Fold Away Handle TA-900 Up to 40 1/2” $4431 ea. Max. Ht. 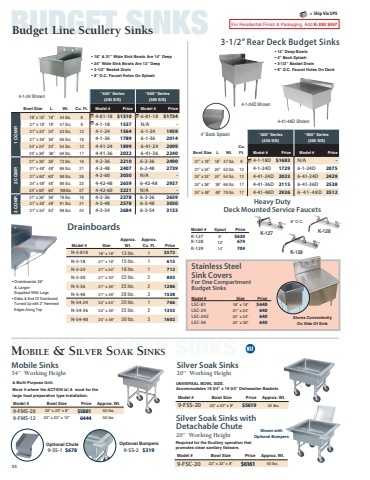 From Floor Flat Top W/ Open Base  Stainless Steel TOP Stainless Steel LEGS  Length 2’ Model # Price Model # Price Model # Price Model # Price Spec-Line Premium Standard Super Saver Bullnose Edge 25 lbs. 3 42 lbs. 4 53 lbs. 5 64 lbs. 6 74 lbs. 8 85 lbs. 9 103 lbs. 11 114 lbs. 12 130 lbs. 14 227 lbs. 26 251 lbs. 29 266 lbs. 32 47 lbs. 4 52 lbs. 5 59 lbs. 6 72 lbs. 8 85 lbs. 9 93 lbs. 11 113 lbs. 13 126 lbs. 15 150 lbs. 17 261 lbs. 32 268 lbs. 35 283 lbs. 37 75 lbs. 7 82 lbs. 9 96 lbs. 11 108 lbs. 13 127 lbs. 16 140 lbs. 18 165 lbs. 20 261 lbs. 38 290 lbs. 41 305 lbs. 45   14 Ga. 304 S/S 14 Ga. 304 S/S 16 Ga. 304 S/S 16 Ga. 430 S/S Approx. Shipping Weight Approx. Cubic Feet              TVSS-242 $1747 TVSS-240 1864 TVSS-243 1930 TVSS-244 1984 TVSS-245 2105 TVSS-246 2229 TVSS-247 2720 TVSS-248 2875 TVSS-249 3364 TVSS-2410 3572 TVSS-2411 3867 TVSS-2412 3945 TSS-242 $1204 TSS-240 1327 TSS-243 1390 TSS-244 1444 TSS-245 1564 TSS-246 1685 TSS-247 2260 TSS-248 2417 TSS-249 3084 TSS-2410 3291 TSS-2411 3517 TSS-2412 3591 TMS-242 $1126 TMS-240 1229 TMS-243 1290 TMS-244 1337 TMS-245 1440 TMS-246 1550 TMS-247 2089 TMS-248 2228 TMS-249 2811 TMS-2410 3017 TMS-2411 3215 TMS-2412 3289 TSAG-242 $1092 TSAG-240 1184 TSAG-243 1245 TSAG-244 1275 TSAG-245 1363 TSAG-246 1460 TSAG-247 1776 TSAG-248 1898 TSAG-249 2659 TSAG-2410 2870 TSAG-2411 3035 TSAG-2412 3109                 30” 3’ 4’ 5’                                       24” 6’     WIDE 7’ 8’ 9’ 10’ 11’ 12’                      2’ 30” 3’ 4’ 5’ TVSS-302 1799 TVSS-300 1940 TVSS-303 2002 TVSS-304 2086 TVSS-305 2230 TVSS-306 2454 TVSS-307 2815 TVSS-308 2920 TVSS-309 3676 TVSS-3010 3880 TVSS-3011 4158 TVSS-3012 4231 TSS-302 1259 TSS-300 1401 TSS-303 1463 TSS-304 1547 TSS-305 1690 TSS-306 1838 TSS-307 2357 TSS-308 2605 TSS-309 3326 TSS-3010 3530 TSS-3011 3810 TSS-3012 3885 TMS-302 1170 TMS-300 1301 TMS-303 1359 TMS-304 1422 TMS-305 1557 TMS-306 1685 TMS-307 2174 TMS-308 2392 TMS-309 3037 TMS-3010 3245 TMS-3011 3486 TMS-3012 3560 TSAG-302 1132 TSAG-300 1238 TSAG-303 1305 TSAG-304 1353 TSAG-305 1469 TSAG-306 1584 TSAG-307 1839 TSAG-308 2046 TSAG-309 2852 TSAG-3010 3062 TSAG-3011 3268 TSAG-3012 3340                                            30” 6’     WIDE 36” 7’ WIDE 7’ 8’ 9’ 10’ 11’ 12’ 3’ 4’ 5’ 6’                      8’ 9’ 10’ 11’ 12’ TVSS-363 2365 TVSS-364 2411 TVSS-365 2582 TVSS-366 2762 TVSS-367 3344 TVSS-368 3544 TVSS-369 4297 TVSS-3610 4501 TVSS-3611 4825 TVSS-3612 4899 TSS-363 1702 TSS-364 1747 TSS-365 1913 TSS-366 2085 TSS-367 2768 TSS-368 2974 TSS-369 3932 TSS-3610 4139 TSS-3611 4462 TSS-3612 4545 TMS-363 1608 TMS-364 1655 TMS-365 1807 TMS-366 1961 TMS-367 2619 TMS-368 2811 TMS-369 3689 TMS-3610 3895 TMS-3611 4193 TMS-3612 4273 TSAG-363 1493 TSAG-364 1545 TSAG-365 1694 TSAG-366 1845 TSAG-367 2507 TSAG-368 2688 TSAG-369 3472 TSAG-3610 3681 TSAG-3611 3941 TSAG-3612 4014                             4’ TVSS-484 5’ TVSS-485 4311 TSS-484 3369 4659 TSS-485 3719 4987 TSS-486 4046 6374 TSS-487 5431 6793 TSS-488 5855 7862 TSS-489 6870 7995 TSS-4810 7002 8126 TSS-4811 7134 8260 TSS-4812 7267 128 lbs. 12 148 lbs. 15 170 lbs. 17 206 lbs. 20 228 lbs. 23 260 lbs. 44 454 lbs. 49 517 lbs. 54 532 lbs. 58 TVSS-486 8’ TVSS-488 NOT AVAILABLE 48” 6’ 7’ TVSS-487 WIDE 9’ 10’ TVSS-4810 TVSS-489 11’ TVSS-4811 12’ TVSS-4812 34 Units 8 ft. and larger furnished with 6 legs. SPECIAL LENGTHS: Select next largest size. Add Model # TA-61 No Charge (ex. SS-306 with TA-61 size to 66” long).